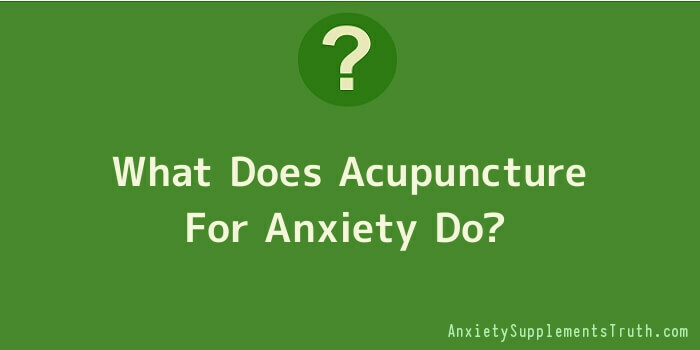 What Does Acupuncture For Anxiety Do? Acupuncture for anxiety treats the underlying cause of the anxiety, while also eliminating symptoms. All conditions have a cause associated with an organ system, though they can also be exacerbated by external pathogens, such as damp or heat. The meridians carry energy and nourishment to each organ and support all body functions. When the Qi is blocked somewhere along the way, an imbalance occurs and some areas of the body can become deficient, while others become excessive. Acupuncture for anxiety stimulates acupuncture points along the meridians to clear blockages and stagnation and create balance. With balance, an individual is free from mental, physical, and emotional problems. Depending on the type of anxiety you suffer, the diagnosis and treatment plan can differ. A common issue seen in people with generalized anxiety disorder is fear, which can be associated with the Kidney energy. Therefore, acupuncture points along the Kidney meridian are sometimes stimulated to strengthen the Kidney Qi. The Liver handles the flow of emotions, so this meridian may be addressed to balance and enhance its function. The Spleen energy also plays a role in anxiety so acupuncture aims to balance and support the function of the Spleen. This type of technique makes anxiety symptoms much more manageable. When the practitioner has determined the root cause that too will be treated for long lasting relief. In addition to harmonizing the organ systems for an unencumbered flow of Qi, acupuncture for anxiety also improves your overall health, strengthens the body and mind, and provides relaxation. All of these aspects are important for overcoming anxiety. The process of acupuncture triggers the body’s internal healing mechanism to naturally resolve ailments. Scientific studies have translated acupuncture’s effects into Western medical terms. It is believed that acupuncture stimulates the central nervous system and provides relaxation, which eases anxiety. By targeting certain points on the body, the brain triggers the release of endorphins and neurotransmitters, such as serotonin. These “feel good” chemicals serve to further relax the muscles, slow the heart rate, decrease the blood pressure, and create a sense of wellbeing. Serotonin plays an important role in our emotional state and by increasing the level of serotonin, along with altering the neurochemistry of the brain; it is thought that acupuncture can directly promote internal healing.